This car attracted unprecedented attention when it was introduced in October 2001 at the Tokyo Motor Show. The futuristic yet traditional form of this car, with economized front/rear overhang and exaggerated wheel arch, has been authentically reproduced by Tamiya as a 1/10 scale R/C model. Light-weight, super-durable monocoque frame employs high-reliability shaft driven 4WD with double wishbone independent suspension. Front and rear enclosed gear boxes house differential gears to facilitate smooth driving. Chassis features superior weight distribution and no-nonsense handling. This model is just another TL01 chassis with a new body, and it doesn't even have the improved TL01LA suspension. 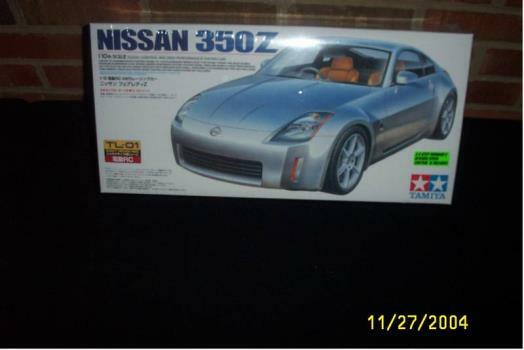 Nothing special about that, but I'm sure the 350Z is bound for a future as a highly desirable collectible. 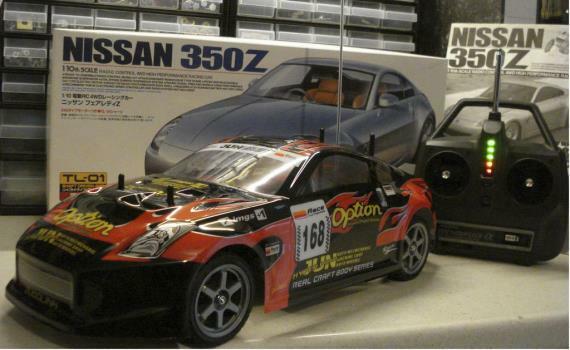 The real 350Z is already an icon, and demonstrates the new direction and revival of Nissan as a manufacturer of lightweight and sensibly priced sportscars, though compared to the 240Z, both weight and price have increased dramatically. 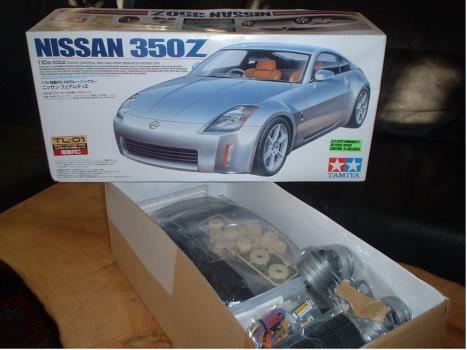 Both Tamiya collectors and Nissan enthusiasts will want this model in the future, so it might be a good investment already now. The TL01 chassis is so widely used by Tamiya, and accordingly well known among you, that I won't comment on it at all. The real 350Z is "just" rear wheel drive, so the 4WD of the model isn't really authentic, but handling benefits from it, and I think it's OK. Funny to think about that we had the "opposite" probelm back in the early eighties. Tamiya launched models like the Audi Quattro, Subaru Brat and others, and we would have loved them to be 4WD (for handling and realism), and they were all rear wheel drive only! 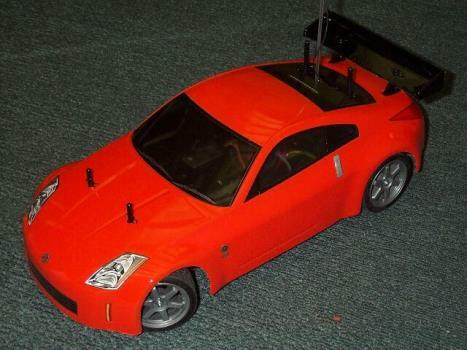 The body of the 350Z is Tamiya quality all the way, and proportions and looks are spot on. Tamiya has included an unrealistic (but surely effective) rear wing with it though, and if you don't want to use it (I definately don't!) the sticker sheet includes two small silver coloured rectangles to cover the depression for the wing mounts on the rear deck lid. These depressions must be infectious, because I got a depression myself when I first saw them! 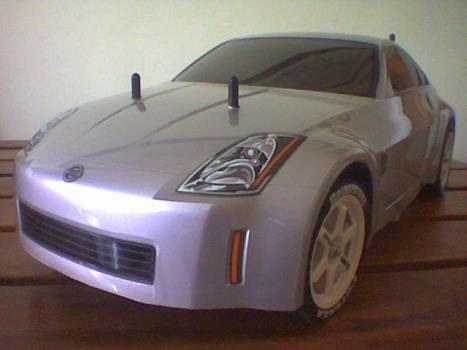 Most imporant, the body will never look quite right, and if you decide to paint it any other colour than silver (anything but the metallic orange "launch colour" of the real 350Z is wrong to me), you will have to find or make other stickers to cover the depressions with, but it still won't look good. I see two options: you keep the model NIB or decorate it like a racecar (with wing). I haven't yet seen a real 350Z as a racecar, but the colour scheme and decals from the 300ZX (IMSA or GTS) should look great!